Smartphone screens keep getting larger so Giftster has released an upgrade to the mobile editions to handle that. Giftster is a free online gift idea sharing platform, connecting families around gift giving occasions. One member of the family starts a private group with Giftster, and invites the rest of the family to join. Once invitations are accepted, a permanent place for sharing Christmas wish list and gift preferences is established, accessible by everyone in the family. Since Giftster is a connected web service, all computers and devices synchronize instantly, so the very latest gift information is available to any device. Giftster is known for giving everyone in the family a way to connect, whether on a desktop PC, Mac, smartphone or tablet. 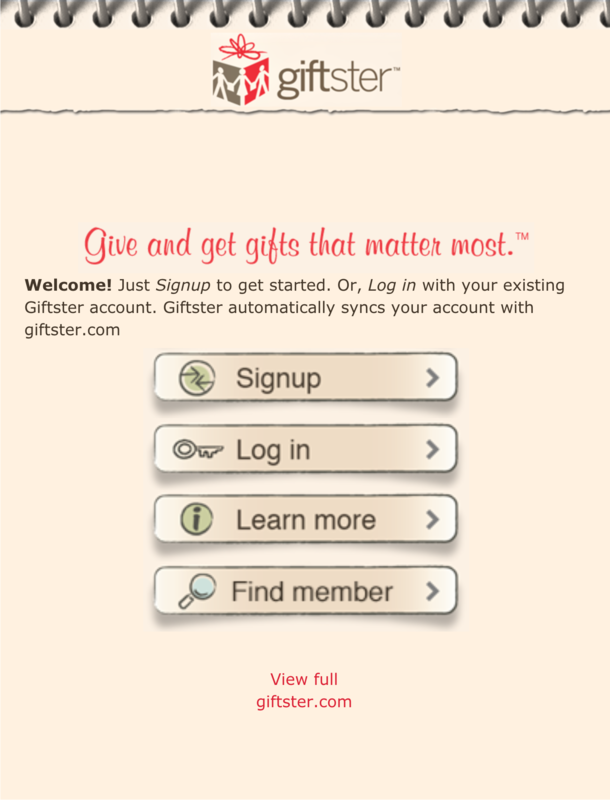 Giftster version 3.0 is the gift registry mobile app that runs in a browser. It runs on most mobile browsers including those for iOS, Android, Windows, and others. This latest release provides the best experience yet with a responsive design that automatically fits most screen sizes. Android Giftster version 3.0 is now available in Google Play. The new version of the Android Giftster app ads responsive screen sizing for both mobile and tablet screen dimensions, perfect for LG, Samsung, HTC, Amazon Fire and other manufacturer's phones and tablets running a versions of Android. Gift anxiety occurs both in attempting to select the right gifts, and in receiving them when the recipient feels pressure not to reject an unwanted gift. Giftster helps eliminate gift anxiety. The giver knows they picked something the recipient really values, and they have the peace of mind knowing they marked it reserved so there won't be a duplicate. The receiver knows the chances are good they will open gifts that are exactly the ones they would have picked out for themselves. No returns, no duplicates, no wasted time and money with Giftster. Giftster is defining the standard for a permanent, lifetime gift registry for families and close friends. Giftster is the central place for families to post and maintain shared wish lists and gift preference profiles, accessible only to members of that family. Giftster is independent of any one retailer, and one member of the family administers the group to maintain privacy and decide who is included in each group and gift exchange. Giftster synchronizes instantly among versions for the web at http://www.giftster.com, for iPhone at Apple iTunes, for Android at Google Play, and other browsers on smartphones and tablets with m.giftster.com. Giftster is a registered trademark and "lifetime gift registry" is a trademark of MyGiftster Corporation. Press resources located at http://www.giftster.com/press/.